I've got a new item for sale in my etsy shop!! 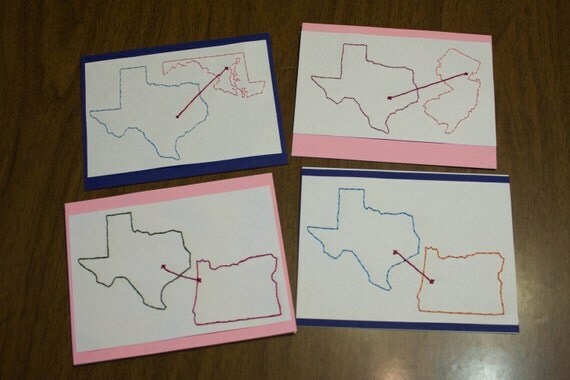 These country cards would be awesome to give to a friend who just adopted a baby from overseas. They would be great for families hosting a foreign exchange student. They would be great for teachers that have student teachers from a different country...and that's why this card was created. I am so glad that Jennifer asked me to make this card and that she gave me a creative license to make it how I thought it would look best. I stitched the countries in the colors of their flags. I also added a small state outline to where the card was coming from and where it was going. 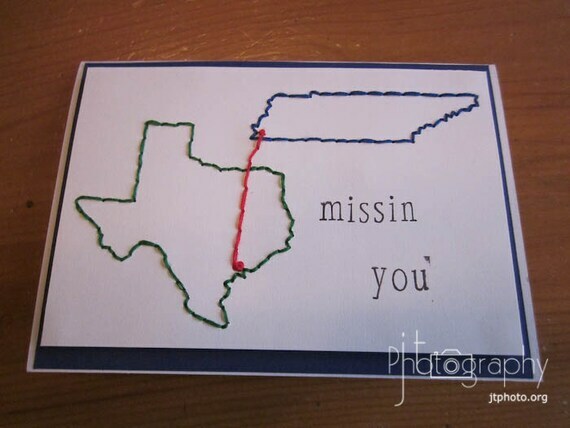 When you order the card just let me know what city, state and country the cards is coming from and also the city, state and country that it's going to. I will do my research and make it as authentic as possible. I am so excited to have something new to offer. These can be found in my etsy store!! These are great as cards but talk to me today about how I could create one suitable for framing!! Don't forget I also offer state to state cards!! All cards can be left blank or stamped with an phrase on the outside and the inside!!! let me know what I can create for you today!